State of Origin was a bigger deal than normal at Sydney Olympic Park this year — with NSW Blues one game up in the series it was up to them to win at home and take the title back from Queensland after a seeming eternity (eight years) in the shadows. To make sure that ANZ Stadium was unmistakably the ‘Home of The Blues’ the blue lights were turned on in force, with giant projections across the front and spirals showing blues greats scoring classic tries. Fans were treated to inspiring slogans on a big screen just outside the train station, on the front of the stadium and on a giant floating sphere tethered above the bar area. This year though you could “talk back” via Twitter! 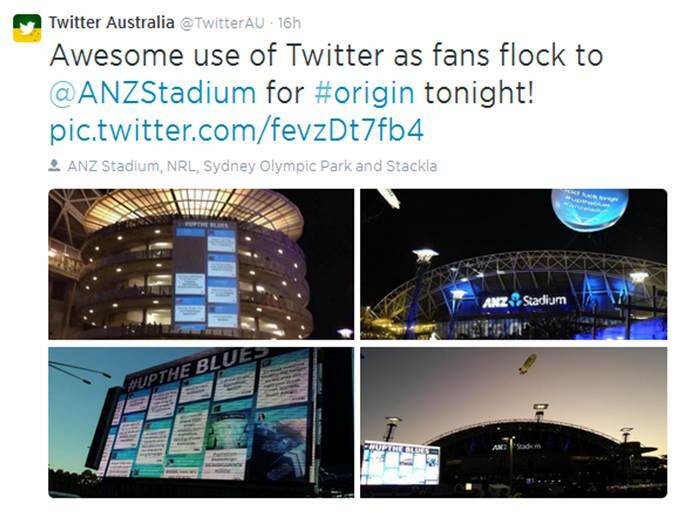 The team at Sydney Olympic Park Authority and ANZ Stadium in conjunction with Twitter Australia used an Australian innovation called Stackla to aggregate a selection of posts from social media that had included a hashtag such as #uptheblues or #origin. Stackla then provided us three different configurations of their page – one for the Big Screen and the side of a corporate building along Murray Rose Ave, one for the side screens on ANZ Stadium and one for the floating sphere. The result was spectacular with messages of support (and fear from some Queensland fans) going directly on display to capture the excitement and atmosphere of the moment. Twitter, ANZ Stadium and Sydney Olympic Park Authority all worked very well in a short time frame to add this feature to the evening, and with the result everyone wanted (except Queensland!) it is the first time that a series win by NSW was broadcast on Twitter!